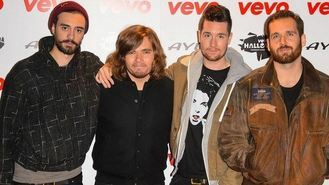 The move - which has been backed by the music industry - could see popular acts such as Bastille feature in the Official Singles chart from Sunday, July 6. The four-piece rock band paved the way for streaming success with their debut song Pompeii, which has been streamed more than any other track in the UK, with more than 26 million plays. Frontman Dan Smith said: "I think for the charts to be fair it has to reflect how people digest music." To qualify for a place on the official chart, songs must be streamed for a minimum of 30 seconds and there will be controls in place to stop users playing songs too many times in order to manipulate the chart. Meanwhile, Ed Sheeran has just been revealed to have beaten the likes of Dolly Parton, Arcade Fire and Metallica, to become the most streamed artist on the Glastonbury Festival line up on Spotify. Despite the pop star not playing a headline slot at this year's festivities in Worthy farm, the 23-year-old's streams have overtaken headline acts including Kasabian. His acoustic 2012 track Give Me Love has reached a staggering 35 million streams alone. Also reigning high in the streaming popularity stakes are Ellie Goulding and Lana Del Rey who came in at second and third respectively. Official Charts Company chief executive Martin Talbot said: "Audio streaming has grown at an extraordinary rate over the past year - and the time is now right to take this important step. "The Official Singles Chart is, and always has been, the most trusted and definitive measure of Britain's music tastes. Just as it has evolved through the years to reflect the most popular music in the UK, from 10-inch to 7-inch, vinyl to cassingles, CD singles to downloads, this is the latest stage of that progression."